This morning, as I was about to leave for a day's caching, a Parcelforce van pulled up, and I was asked to sign for a parcel. On the outside of the parcel, it said "RS". That's Radiospares, or at least that what they used to be called, I think they call themselves RS Components these days. Anyway, there's only one thing I've ordered from them recently - ten Raspberry Pies! So I signed, took them indoors, and then went out caching. When I got back, I opened the envelope (they were each in a nice plastic case, and the whole lot in a flimsy Tyvek envelope, lined with bubblewrap. And I counted them. Nine. Oh. The delivery note inside said ten. I think I know what happened. here's a picture of the package. The blue splodge is me not wanting to put my address on the internet. As you can see, it's been opened, and then closed again with a couple of strips of sticky tape. 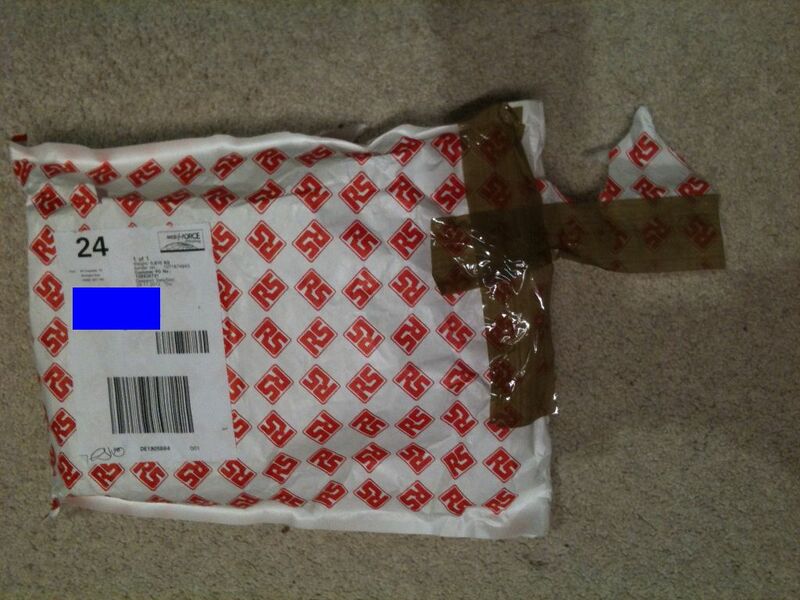 Either this happened by accident, and Parcelforce resealed it (but surely they'd have done it rather better?) Or else someone opened it on purpose and stole one of the Pies. I'll call RS as soon as possible to tell them about this, and ask what they plan to do (although, since I signed for it, the answer is probably "nothing"). Should I have opened the package and counted the contents, given the state it was in? Probably. But I doubt if I would have, and anyhow, I'm usually not there and someone else would sign for things, and they certainly wouldn't have counted them. Oh well. It's not that big a deal. One Pi is £20-worth, and it's not like I bought ten because that's exactly how many I needed, it was just a round number. What is excellent, is that the delivery date was supposed to be December 18, so they're a couple of weeks early, and I was expecting them to be somewhat late, because things often are. Of course, all the bits and bobs (SD cards, cables etc) aren't here yet - I wasn't in a hurry to get those because I wasn't expecting the Pies just yet. But I'll be able to get at least a few of them into action. Always sign as unchecked and if you can cross out received in good condition. I know, I know. I usually do that. But I was so excited at the Pies arriving, plus I was just about to set off for a day's caching. The return of the Geocaching Robot Arm! Faster DSL, a new windscreen and the squits.